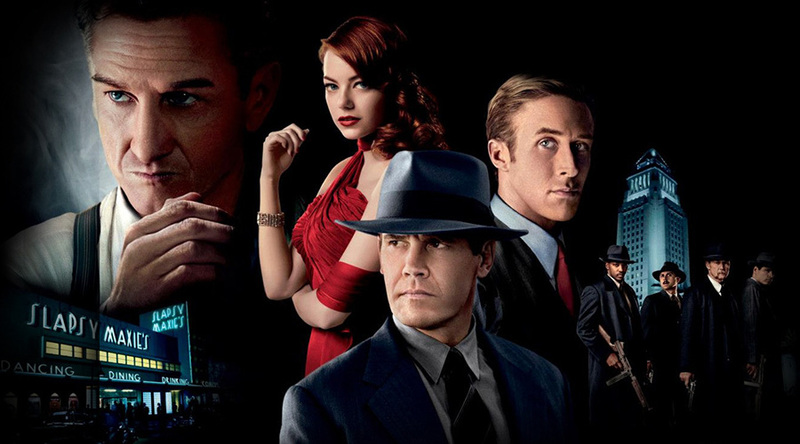 In a case of “never let the truth get in the way of good story” Gangster Squad comes roaring unto the screens this holiday season. The crime drama features a high power cast with Sean Penn (hamming it up big time), Josh Brolin, Ryan Gosling and Emma Stone to name just a few. It’s a big budget affair with a great look, eye candy sets and cars (the land boats of that era were so cool) and lots and lots of action. The story line mainly focuses on real-life gangster Mickey Cohen and the extremes the authorities back in the day used to bring him down. Cohen’s real life story makes for fascinating reading but the movie only taps into a fraction of that but the parts they do use succeed in making Penn as Cohen one of the most over the top villains in screen history. He chews up and spits out so many gangster clichés, it become quite hilarious. The original cut of the film was modified after the Dark Knight Rises shooting in Aurora, Colorado (it having featured a scene of a shooting in the Grauman’s Chinese Theatre in Los Angeles) but the film is still exceedingly violent. Its straightforward plot and pace doesn’t tax the gray matter much but rewards fans of the action genre with plenty to experience. Summertime here in Australia is the perfect time to get lost in the air-conditioned dark with an epic adventure and an epic amount of popcorn. Gangster Squad makes perfect fodder for that kind of endeavor. It’s pure entertainment and provides the kind of visceral thrill that only a ten-metre wide screen and huge sound system can provide.